Steam is a place where customers can gain instant access to game titles published by Valve, 2K Games, Capcom, THQ and more. 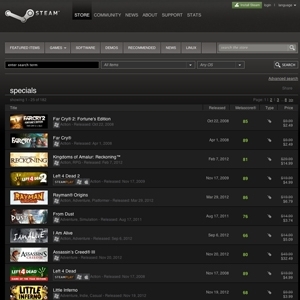 With many titles deeply discounted, Steam not only makes it easy to buy, but also affordable. Which comes as no surprise when you take into account that Steam is owned and operated by Valve Corporation which is a video game development and digital distribution company in Bellevue, WA. Valve Corporation was founded in 1996 by Gabe Newell and Mike Harrington which are former Microsoft employees. The company is well known for developing Half-Life, Counter-Strike, Left 4 Dead and other popular game titles. Store.steampowered.com currently ranks #8 amongst sites offering online deals -- Newegg ranks #7.